(4) Drug effects on the EEG and seizure threshold. (5) The workup of seizures. (6) AED therapy in epilepsy. "Fried egg" cells in a patient with an oligodendroglioma, a brain tumour that frequently presents with seizures. A seizure is usually thought of as a physical convulsion. However, a seizure secondary to epilepsy is defined by the presence of abnormal rhythmic cortical discharges - this usually results in observable physical movements, but not always. Epilepsy is diagnosed clinically, but the electroencephalogram (EEG) can be helpful in making the diagnosis. A seizure is a transient occurrence of symptoms and signs resulting from abnormal excessive or synchronous neuronal discharges in the brain (Fisher et al, 2005). The outward symptoms and signs vary tremendously, from a brief loss of awareness to wild thrashing movement. Whenever an apparent seizure occurs, two things must be remembered. First, not all people with a seizure have epilepsy - there are many conditions that may trigger a seizure and the additional etiologies include all of those for acute confusion (use the acronym SEIES). Second, not all transient shaking episodes are actually seizures - there are several mimics out there (PNEA, syncope, movement disorders, and sleep disorders). Electrographic seizures are abnormal, rhythmic discharges of abrupt onset and termination that always disrupt the background and show an evolving pattern (at least two unequivocal, sequential changes in wave frequency, amplitude, or location) - typically, frequency changes from faster to slower, amplitude changes from lower to higher, and location spreads. That being said, even if the EEG pattern does not meet the above criteria, it could still be a seizure. - Epilepsy can be defined as the occurrence of two or more unprovoked seizures at least 24 hours apart. It may be idiopathic (presumed genetic etiology) or symptomatic (secondary to a known source, such as head trauma, a brain tumour, a stroke, or dementia). In idiopathic epilepsies, there is thought to be a lowered "seizure threshold" that can be lowered even further by alcohol, sleep deprivation, and stress (Epilepsy Foundation, 2008). - It is common, affecting 1% of all people at any time (World Health Organization, 2012) and 4% at some point in time (Wilden and Cohen-Gadol, 2012). - Clinically, most epileptologists classify seizures as focal or generalized using a system proposed ages ago (The International League Against Epilepsy, 1981) with a few modifications. - Diagnosis is based on clinical history. However, an abnormal EEG with any of epileptic discharges, focal slowing, or diffuse background slowing (Ko et al, 2014) is supportive. Video EEG monitoring can be used to classify the type of seizure or syndrome and it can also provide additional information regarding related conditions such as sleep disordered breathing (Phillips et al, 2013). - Focal seizures only affect one hemisphere of the brain. - In simple partial seizures, awareness is retained. These "funny turns" are typically brief - only 60 to 120 seconds long - and consist of a sudden sensation (nausea, a rising epigastric sensation, intense fear, deja vu, or an olfactory hallucination) (Epilepsy Foundation, 2012; Marcuse et al, 2015). They are often exquisitely remembered and may be a prelude to a complex partial or tonic-clonic seizure, in which case the simple partial seizure is referred to as an aura (a perceptual disturbance). Importantly, an aura is still a seizure in itself. - In complex partial seizures, awareness is impaired. These are often preceded by an aura, which is really a simple partial seizure. During a complex partial seizure the patient may display automatisms (automatic behaviour characterized by lip smacking, chewing, or swallowing) accompanied by autonomic features (sweating, pupil dilation, heart rate changes). Memory loss is common. Witnesses may not notice that anything is amiss. Complex partial seizures may be a prelude to a tonic-clonic seizure. - In secondarily generalized seizures, a simple or complex partial seizure usually evolves into a tonic-clonic seizure. - There are two extremely common focal epilepsy syndromes, frontal lobe epilepsy (FLE) and temporal lobe epilepsy (TLE). In FLE, the seizures typically occur in short bursts of less than a minute while the patient is sleeping. The aura often involves fear and this will be displayed on the patient's face. The seizure presentation may range from asymmetric abnormal body posturing (tonic, dystonic, automatisms) to vocal outbursts (screaming, laughing, crying) to repetitive movements (thrashing, pedaling, thrusting). FLE is often misdiagnosed as PNEAs. In TLE, there is typically an aura followed by automatisms plus or minus autonomic features plus or minus a secondarily generalized seizure. - Generalized seizures affect the whole brain. - In absence seizures, awareness is abruptly impaired and there is a pause in whatever activity the person is doing. They are extremely brief, usually no more than 20 seconds. Hyperventilation induces absence seizures in more than 90% of patients. Unlike most seizures, there is no post-ictal disorientation or lethargy. Absence seizures almost only happen in children and teenagers, the latter in the setting of juvenile myoclonic epilepsy. - In myoclonic seizures, there are "jerks" or "jumps." These often happen in the setting of juvenile myoclonic epilepsy. - In tonic-clonic seizures, there are two phases. There is a tonic phase consisting of rapid loss of consciousness followed by skeletal muscle tensing and sometimes an ictal cry (loud moan or scream). The tonic phase lasts only a few seconds. It is followed by a clonic phase consisting of strong contractions and sometimes tongue biting, urinary incontinence, or cyanosis. Tonic-clonic seizures are usually idiopathic and happen in the setting of idiopathic generalized epilepsy, although sometimes they occur in the setting of secondary generalization or in juvenile myoclonic epilepsy. - In atonic seizures, there is a "drop attack" resulting from a brief lapse in muscle tone. They last less than 15 seconds and may sometimes only consist of a head drop. Atonic seizures can happen in Lennox-Gastaut syndrome. - There are several well-described generalized epilepsy syndromes. - Common syndromes include Lennox-Gastaut syndrome (classic triad of cognitive impairment, multiple seizure types, and slow 1.5-2.5 Hz spike and wave on the EEG), juvenile myoclonic epilepsy (JME) (young adults with myoclonic jerks in the late night or morning for a few months followed by generalized tonic-clonic seizures and occasionally absence seizures, and an EEG with very photosensitive 4-6 Hz generalized spike and polyspike-wave discharges), and idiopathic generalized epilepsy (IGE) (adult onset generalized tonic-clonic seizures) (Gardiner 2005). ​- Less common syndromes include conditions such as West syndrome (onset first year of life, "salaam" seizures related to sleep transitions that are associated with regression of milestones, EEG shows hypsarrhythmia, often becomes Lennox-Gastaut syndrome), childhood absence epilepsy (appears around age 5 years, normal kids but higher rates of attentional difficulties, seizures last 10 seconds, EEG shows generalized 3 Hz spike and wave), benign rolandic epilepsy (onset age 3 to 13 years that remits by age 16), juvenile absence epilepsy (JAE) (mostly absence seizures, with tonic-clonic seizures too), and Ramussen syndrome (epilepsia partialis continua and other focal seizures with progressive hemiplegia and cognitive decline). - Seizures are the onset symptom in many patients with brain tumours (Maschio, 2012). These seizures are typically focal and characterized by pharmacological resistance. For some reason, side-effects bad enough to warrant stopping an AED occur in 24% of patients compared to <12% in non-brain tumour epilepsy (Glantz et al, 2000). - Seizures from head trauma occur at least a week after the injury, as opposed to direct injury non-epileptic shaking episodes that occur within the week after trauma (Gupta and Gupta, 2006). Penetration injuries and bleeds (intracerebral or subdural hemorrhage) confer a higher risk of seizures. Post-trauma seizures may occur months or years later. - Advanced Alzheimer's may show focal, generalized, or even periodic epileptic changes, not to mention clinical seizures (Marcuse et al, 2015). - Seizures from eclampsia are tonic-clonic seizures that occur in a pregnant woman with pre-eclampsia (characterized by late pregnancy hypertension and proteinuria). They usually occur after the 20th week of gestation or within the 48 hours following delivery (Hart and Sibai, 2013). - Seizures from sedative withdrawal occur several days after cessation. - Seizures secondary to alcohol overuse are rare but well-documented in case reports (Hattemer et al, 2008). Seizures secondary to alcohol withdrawal are common and typically brief, generalized tonic-clonic seizures that occur 6 to 48 hours after the last drink (Rathlev et al, 2006). Unlike most seizures which originate in the cerebral cortex, alcohol withdrawal seizures originate in the brainstem (Rogawski, 2005). Eliminating the alcohol dependence is more important than prescribing AEDs. - Seizures can occur from organ failure - hepatic encephalopathy (ammonia should be 75 mmol/L or higher), uremia, and global cerebral ischemia. - PNEAs are triggered by an emotionally traumatic past event, internalized emotional conflict, psychosis, or personality disorder (Lesser, 2003). - Clinically they can be differentiated from seizures to a certain extent. PNEAs are far more likely to exhibit biting of the tip of the tongue, duration greater than two minutes, a fluctuating course, closed eyes, and side to side head movements. PNEAs are far less likely to exhibit automatisms, severe lateral tongue biting, and urinary incontinence (Mellers 2005). - Diagnosis can only be definitively made by video-EEG monitoring. - Vasovagal and cardiac syncope can both result in loss of postural tone as well as anoxic tonic and myoclonic convulsions. - Most dyskinetic movement disorders can look like seizures. - Parasomnias are sleep movement disorders that occur in NREM or REM. The NREM parasomnias that mimic seizures include confusional arousals (the patient awakens in a confused state), sleep terrors (involving panic, loud screams, and violence), and sleepwalking (sitting up and looking around, walking around, or talking to people not there). The REM parasomnias that mimic seizures include REM sleep behaviour disorder (dreams are acted out). The culmination of uncontrolled epilepsy is status epilepticus, defined either as a continuous, life-threatening, unremitting seizure lasting longer than 5 minutes or recurrent seizures without regaining consciousness between seizures for greater than 5 minutes (Nair et al, 2011). After 5 minutes, a seizure is unlikely to self-terminate and neuronal damage can ensue. Mortality stands at 20% (Trinka et al, 2012). Status epilepticus us an umbrella term that may range from overt clinical seizures (generalized tonic-clonic, myoclonic) to subtle clinical manifestations (minor facial twitching or nystagmoid jerking of the eyes as seen in epilepsia partialis continua) to no clinical manifestations (non-convulsive status epilepticus). Those with generalized tonic-clonic or myoclonic seizures require swift and aggressive management. Those with epilepsia partialis continua can occur in a perfectly alert and conversing patient and require various trials of AEDs with the aim of avoiding intubation. Those with non-convulsive status epilepticus can have the diagnosis confirmed with a favourable clinical or EEG response to diazepam 10 mg iv. Basically, any person who has had clinical seizures and is not back to baseline should have an urgent video EEG. There are several options available to treat status epilepticus (see appendix 2 in Marcuse et al, 2015). Wait 5 minutes - give oxygen and get two lines in. ​Consider thiamine 100 mg iv, dextrose 25 g iv and consider naloxone 0.4 mg (up to 1.2 mg) iv, flumazenil 0.2 mg (every minute up to 5 mg) iv. If iv access, give clonazepam 1 mg iv or lorazepam 4 mg iv or diazepam 5-10 mg iv (repeat all in 5-10 minutes if needed). ​If no iv access, give midazolam 5-10 mg intramuscular/intranasal/intrabuccal (repeat in 5-10 minutes if needed). Phenytoin 20 mg/kg (for a 70 kg patient this is 1400 mg) iv over 30 minutes. If not controlled, additional 10 mg/kg iv over 30 minutes. Check level after (want 80-120 umol/L). Valproate 20 to 40 mg/kg iv over 30 minutes. If not controlled, additional 20 mg/kg iv over 30 minutes. Maintenance 20 mg/kg iv bd. Avoid in liver disease. ​Lacosamide 200 to 400 mg iv over 30 minutes. Maintenance 200 mg iv bd. Avoid in severe renal failure. Phenobarbitone 20 mg/kg iv over 30 minutes, If not controlled, additional 5 mg/kg iv over 30 minutes. Consider a continuous infusion of midazolam, propofol, or thiopental, or general anesthesia. If clinical remission but no return to baseline, connect to a video EEG. It is best to avoid short-acting (midazolam) and long-acting (diazepam) benzodiazepines, but they can be used if necessary. The EEG is a graphical representation of differences in voltage generated by neural activity (Boutros et al, 2011). The purpose of the EEG is to detect interictal or ictal activity and localize its origin. There are many normal interictal variants that must not be over-called as epileptic. Likewise, there are a few interictal abnormalities that must not be missed. However, the general rule when reading an EEG is when in doubt, under-call. There are three steps. First, mention whether the patient is awake or in drowsy or asleep, mention the background waveform symmetry and frequency, mention whether there are any normal or abnormal EEG changes, and mention the presence of hyperventilation and photic stimulation responses. Second, describe any seizures if present. Third, provide an impression and mention whether the findings are nonspecific or consistent with a particular diagnosis. - Stage 1 shows slowing, fragmentation, and disappearance of the posterior dominant rhythm; there may be beta and theta activity as well as vertex waves (synchronous, episodic, sharply contoured, usually theta frequency potentials that are maximal over the midline) and positive occipital sharp transients of sleep (POSTs) (occipital sharp waves that can occur in long rhythmic runs). - Stage 2 is characterized by K-complexes (high-voltage, synchronous, slow potentials) often followed by sleep spindles (synchronous, sinusoidal waves with maximal potentials in the central regions). - Slow wave sleep has increasing amounts of diffuse delta slowing. ​- REM sleep has low-voltage theta activity with vertical and horizontal eye movements, and epileptic discharges are seldom present in REM sleep. - There are several that may be seen. (a) Alpha (8 to <13 Hz). - Normally present in all adults. Forms the posterior dominant rhythm which is more prominent over the bilateral occipital regions and attenuates with eye opening. There may be beta activity frontocentrally. - May indicate an abnormal state. The absence of the posterior dominant rhythm on one side is always pathological (stroke in elderly, congenital or traumatic in young). If alpha activity is equally prominent over the frontal regions and does not react to eye movements it may indicate alpha coma which results from severe global cerebral dysfunction. - Normally present in many patients. May be maximal over the frontocentral regions or widespread. - May be abnormal. Beta activity increases in amplitude and abundance with various medications (benzodiazepines, tricyclic antidepressants, barbiturates) and can even culminate in beta coma due to intoxication, which has a favourable outcome. In other cases watch for interhemispheric asymmetry - the side of reduced amplitude may point to an ischemic stroke or subdural collection, or some other structural etiology, whereas the side of increased amplitude may point to breach artifact, or some other structural etiology. - Diffuse theta is normal in children. Roughly one third of normal young adults show intermittent theta maximal over the frontocentral regions during relaxed wakefulness. Roughly one third of normal elderly patients show intermittent theta over the temporal regions during relaxed wakefulness. In drowsy adults of any age, rhythmic mid-temporal theta discharges (RMTD) (rhythmic, unilateral or bilateral, 1-2 second long sharply contoured theta waves in the midtemporal regions) that have no clinical significance. - May be abnormal. In the awake adult, focal theta activity in one location or hemisphere indicates underlying structural disease (meningioma, low-grade glioma, small ischemic stroke - the lesion is usually less extensive than in the case of delta activity) whereas diffuse theta slowing may be secondary to an encephalopathy non-specific for etiology, medications (prochlorperazine, lithium, clozapine), dementia (Alzheimer's, multi-infarct), post-ictal state, congenital brain damage, or theta coma which results from catastrophic brain damage. - May be normal in infants and young children. It may also occur in awake young patients as posterior slow waves of youth (intermittent delta waves over the occipital regions seen in ages 2 to 21), as well as hyperventilating young patients. In elderly patients, there may be intermittent symmetric or asymmetric bitemporal delta slowing that probably represents pathology such as cerebrovascular disease, particularly generalized rhythmic delta activity (GRDA) with a frontal predominance that was previously called sleep-onset FIRDA, but it may not be clinically relevant. Delta activity may occur in drowsy adults of any age. - Usually abnormal in awake adults. In the awake adult, focal polymorphic delta activity is a reliable indicator of localized brain disease, particularly lesions involving the white matter, whereas focal rhythmic delta activity may occur with gray matter lesions; both may be seen interictally in patients with focal seizures. In contrast, diffuse delta slowing indicates an encephalopathy non-specific for etiology or one of the other sources described above for diffuse theta slowing as well as delta coma in massive brain damage. Moreover, GRDA may indicate intoxications, increased intracranial pressure, and deep lesions. - In addition to those described above (Bergen, 2009). (a) Spike and sharp wave mimics. - Small sharp spikes are short duration, small amplitude temporal spikes with a field. - Benign epileptic transients of sleep (BETs) are small sharp spikes occurring during light sleep. - Wicket spikes are symmetric upslope and downslope (like combs or wicket fences) waves occurring in brief runs over the temporal regions. The spikes have similar durations regardless of amplitude. - Phantom spike and waves (5-6 Hz waves) are synchronous, symmetrical small spikes followed by very large slow waves that appear in brief rhythmic runs. - Subclinical rhythm EEG discharges of adults (SREDA) are rhythmic unilateral or bilateral sharply contoured theta waves in patients over 50 years that may "evolve" by becoming shorter in interval. - Mu rhythm consists of unilateral or bilateral arch-shaped centrally predominant waves that attenuates when thinking about moving the opposite limb. - Lambda waves are sharply contoured, usually symmetric waves in the occipital regions that occur with scanning eye movements. - Suggest epilepsy, metabolic dysfunction, or an underlying lesion. (a) Intermittent rhythmic delta activity. - FIRDA is usually associated with cerebral metabolic dysfunction, although GRDA with a frontal predominance may be normal in the elderly. - TIRDA is fairly specific for TLE; found in 28% of TLE patients (Geyer et al, 1999). - OIRDA is mostly seen in children with absence epilepsy but may be associated with metabolic dysfunction. (b) Spikes and sharp waves. - These are usually asymmetric and followed by a time-locked slow wave. - There is no clinically significant difference between spikes and sharp waves - spikes are 20-70 ms and sharp waves are 80-500 ms.
- The prototypes are the generalized 3 Hz spike and wave seen in absence epilepsy and the slow (1.5-2.5 Hz) spike and wave seen in Lennox-Gaustaut syndrome; the latter is bifrontally predominant but generalized at times. (c) Brief potentially ictal rhythmic discharges (BIRDs). - Very brief (<10 seconds) runs of focal or generalized rhythmic activity >4 Hz without evolution. Associated with high risk of seizures and are highly correlated with the seizure focus. (d) Generalized periodic discharges (GPDs). - Synchronous spikes or sharp waves occurring at regular intervals. - Suggest severe bihemispheric dysfunction (such as hypoxic-ischemic encephalopathy, toxic-metabolic encephalopathy, and CJD). - May be seen in relation to intermittent seizures and convulsive on nonconvulsive status epilepticus. (e) Lateralized periodic discharges (LPDs)/periodic lateralized epileptic discharges (PLEDs). - Repetitive blunt delta waves, spikes, or sharp waves that are focal or lateralized over one hemisphere and continue through most of a study. - Strongly suggest an underlying structural lesion, most commonly ischemic stroke but also HSV encephalitis, tumours, abscesses, and intracranial bleeds. - Often are simply a sign of dysfunction and do not represent seizures. If the patient is asymptomatic, no treatment is needed. However, if the LPDs/PLEDs occur in a time-locked pattern with epilepsia partialis continua, are greater than 3 Hz, display electrographic evolution, or if there is a clinical correlation (eye deviation, nystagmus, hemiparesis, sensory disturbance, aphasia, hemianopia, or a depressed level of consciousness) then the pattern is ictal and treatment is needed. - Waves with an initial negative deflection, a second longer positive deflection, and a third longest negative deflection. - Can become periodic, as in GPDs with triphasic morphology. It can be hard to tell between GPDs secondary to a metabolic source versus non-convulsive status epilepticus. - Seen in metabolic encephalopathies, particularly hepatic encephalopathy but also uremia, sepsis, and electrolyte disturbances. - Cycling of marked cerebral activity depression with bursts of activity of variable amplitude, duration, and waveform. - More than 50% of the record must consists of suppression, with bursts lasting 0.5-30 seconds (Marcuse et al, 2015). - Classically occurs with general anesthesia (awake-->normal sleep-->diffuse delta waves--> burst-suppression-->isopotentiality). - In the abnormal situation, occurs with cardiopulmonary arrest when suffering from cerebral anoxia. There may be GPDs or LPDs accompanying the bursts that are clinically correlated with myoclonus. Poor prognosis. - During hyperventilation, it is normal for theta and delta slowing with bifrontal preponderance to occur in young patients; the technique has little effect in the elderly. In the abnormal situation, hyperventilation is useful in bringing out focal slowing and epileptic discharges. - During photic stimulation, a normal rhythmic frequency in the occipital regions termed photic driving may occur. In the abnormal situation, photic stimulation is useful in patients with epilepsy who are suspected of having seizures precipitated by flashing light in whom it may bring out a photoparoxysmal response (synchronous high-voltage spike/polyspike wave discharges). There are many. This list is not exhaustive. - Carbamazepine and oxcarbazepine may produce diffuse slowing. - Valproate at toxic levels may produce an encephalopathy with diffuse delta waves. - Tricyclics (imipramine, amitriptyline, nortriptyline, doxepin, desipramine) increase beta activity, can produce slow waves and spikes, and at high doses reduce seizure threshold. - Buproprion lowers the seizure threshold. - SSRIs can produce serotonin syndrome with mental status changes, autonomic instability, myoclonus, and tremor. EEG shows diffuse slowing, spikes, and GPDs with triphasic morphology. - All antidepressants except trazodone reduce REM sleep. - Penicillin, the cephalosporins, and the carbapenems (especially imipenem) are all pro-convulsant resulting in altered mental status, jerks, generalized seizures, and even status epilepticus. - Risk factors include high doses, renal failure, and meningitis. - Produce increased beta activity particularly over the frontal regions. - At toxic levels, produce diffuse unreactive delta activity and even burst-suppression and an isopotential, flat record. - Produce prominent beta activity. - Reduce stage 1 and slow wave sleep. - In the 6 to 48 hours after alcohol cessation, generalized spikes or LPDs may occur. Seizures and even status epilepticus can also result. These may be treated with benzodiazepines as well as other AEDs. - May see focal or diffuse slowing, intermittent delta waves, triphasic waves, and occasional spikes. Exclude a drug source for the seizure. FBC, electrolytes, Cr, LFTs, coags, and fasting BSL. MRI brain (3T with temporal lobe views). Consider ECG, TTE, Holter monitoring, and tilt table test (if syncope suspected). Consider video EEG monitoring if multiple medications have failed. For a single provoked or unprovoked seizure, it is usually - though not always - wise to hold off AED therapy. A frank discussion should take place regarding the risk of a recurrent seizure. In the case of an unprovoked first seizure, the recurrence risk within the first two years varies greatly from 15-80% (Ko et al, 2014) depending on risk factors. For a patient with a single unprovoked generalized tonic-clonic seizure, a normal EEG, a normal MRI brain, and no evidence of focal onset, the risk is 15%, but for a patient with an abnormal EEG, abnormal MRI brain, and evidence of focal onset, the risk is 70% (Ko et al, 2014). For the former, the only treatment required is to advise the patient that they should avoid typical triggers such as alcohol and sleep deprivation. For the latter, AED therapy is usually the way to go. The correct course of action when a patient with a single unprovoked generalized tonic-clonic seizure with only one of an abnormal EEG, abnormal MRI brain, or evidence of focal onset is debatable. However, since the risk of a recurrent seizure in this setting is roughly 40% (Ko et al, 2014), it is not unreasonable to hold off AED therapy. If it is decided that AED therapy is to be commenced for seizures, carbamazepine and valproate remain first-line recommendations. This was validated in the SANAD trial (Marson et al, 2007). 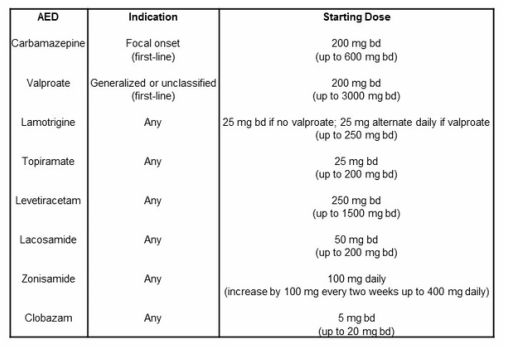 Regretfully, levetiracetam was not entered into the SANAD trial although it has been shown to be just as good as carbamazepine in focal onset epilepsy (Brodie et al, 2007) and it is certainly no slouch in treating generalized or unclassified epilepsies. Moreover, in utero exposure to levetiracetam is far less damaging than valproate (Shallcross et al, 2014) and it does not negatively affect thinking, movement, or language compared to children unexposed to any AED (Ko et al, 2014). Thus, a strong argument can be made that the best AED for any seizure type in a woman of childbearing age is levetiracetam, period. This of course assumes that there is no history of depression or psychiatric symptoms. Even with AED treatment, 30% of patients have medically refractory epilepsy (Marcuse et al, 2015). These patients should be considered for the ketogenic diet, vagal nerve stimulator, or surgery. If a patient has two years of seizure freedom, a good rule of thumb is that there is a 60% chance of remaining seizure free after slow withdrawal of medication (Marcuse et al, 2015). Here is a synopsis of epilepsy treatment. For medically refractory patients, consider ketogenic diet, vagal nerve stimulation, and surgery (lesionectomy or lobectomy). Determine and explain driving restrictions (http://www.nzta.govt.nz/assets/resources/factsheets/17/docs/17-epilepsy.pdf). The stigma and seizure risk associated with uncontrolled epilepsy can shatter quality of life (Baker et al, 1997). Fortunately, AED therapy enables roughly 70% of all treated patients to achieve seizure remission (Eadie, 2012; Schmidt and Loscher, 2005). That is a good number, but it still means that roughly 30% of patients do not achieve it. Generally, if a person has tried two adequate doses of AED without a clinical response then it means that the patient has medically refractory epilepsy and these patients should be considered for other options such as a ketogenic diet, vagal nerve stimulator, or surgery. In the case of PNEAs, a simple tactful discussion of the diagnosis can be quite helpful. Among six studies including 317 patients, roughly 40% became attack-free and 30% experienced attack reduction (Lesser, 2003). Those PNEA patients with no additional psychiatric diagnosis have a better chance at achieving remission (Lempert and Schmidt, 1990). Baker et al. 1997. Quality of life of people with epilepsy: a European study. Epilepsia 38(3), 353-362. Bergen. 2009. Benign EEG patterns: is there more to learn? Clinical Neurophysiology 120(5), 856-861. Boutros et al. 2011. Standard electroencephalography in Clinical Psychiatry: A Practical Handbook. Hoboken, NJ: Wiley and Sons. Brodie et al. 2007. Levetiracetam study group monotherapy comparison of levetiracetam and controlled-release carbamazepine in newly diagnosed epilepsy. Neurology 68, 402-408. Eadie. 2012. Shortcomings in the current treatment of epilepsy. Expert Review of Neurotherapeutics 12(12), 1419-1427. Epilepsy Foundation. 2008. Seizure Mechanisms and Threshold. Fisher et al. 2005. Epileptic seizures and epilepsy: definitions proposed by the International League Against Epilepsy (ILAE) and the International Bureau for Epilepsy (IBE). Epilepsia 46(4), 470-472. Gardner. 2005. Genetics of Idiopathic Generalized Epilepsies. Epilepsia 46(9), 15-20. Geyer et al. 1999. Significance of interictal temporal lobe delta activity for localization of the primary epileptogenic region. Neurology 52(1), 202-205. Glantz et al. 2000. Practice parameter: anticonvulsant prophylaxis in patients with newly diagnosed brain tumours. Neurology 54, 1886-1893. Gupta and Gupta. 2006. Post traumatic epilepsy: a review of scientific evidence. Indian Journal of Physiology and Pharmacology 50(1), 7-16. Hart and Sibai. 2013. Seizures in pregnancy: epilepsy, eclampsia, and stroke. Seminars in Perinatology 37(4), 207-224. Hattemer et al. 2008. Recurrent alcohol-induced seizures in a patient with chronic alcohol abuse. Epileptic Disorders 10(2), 162-164. Ko et al. 2014. Epilepsy and Seizures. http://emedicine.medscape.com/article/1184846-overview. Lempert and Schmidt. 1990. Natural history and outcome of psychogenic seizures: a clinical study in 50 patients. Journal of Neurology 237(1), 35-38. Lesser. 2003. Treatment and outcome of psychogenic nonepileptic seizures. Epilepsy Currents 3(6), 198-200. Luhdorg et al. 1986. Etiology of seizures in the elderly. Epilepsia 27, 458-463. Marcuse et al. 2015. Rowan's Primer of EEG. Elsevier, 2nd edition. Marson et al. 2007. A randomised controlled trial examining the longer-term outcomes of standard versus new antiepileptic drugs. The SANAD trial. Health Technology Assessment 11, 1-134. Maschio. 2012. Brain tumor-related epilepsy. Current Neuropharmacology 10(2), 124-133. Mellers. 2005. The approach to patients with "non-epileptic seizures". Postgraduate Medical Journal 81(958), 498-504. Myint et al. 2006. Post-stroke seizure and post-stroke epilepsy. Postgraduate Medical Journal 82(971), 568-572. Nair et al. 2011. Status epilepticus: why, what, and how. Journal of Postgraduate Medicine 57(3), 242-252. Phillips et al. 2013. Routine polysomnography in an epilepsy monitoring unit. Epilepsy Research 105(3), 401-404. Rathlev et al. 2006. Alcohol-related seizures. The Journal of Emergency Medicine 31(2), 157-163. Rogawski. 2005. Update on the neurobiology of alcohol withdrawal seizures. Epilepsy Currents 5(6), 225-230. Shallcross et al. 2014. In utero exposure to levetiracetam vs valproate: development and language at 3 years of age. Neurology 82(3), 213-221. The International League Against Epilepsy. 1981. Proposal for revised clinical and electroencephalographic classification of epileptic seizures. Epilepsia 22(4), 489-501. Trinka et al. 2012. Causes of status epilepticus. Epilepsia 53, 127-138. Wilden and Cohen-Gadol. 2012. Evaluation of first nonfebrile seizures. American Family Physician 86(4), 334-340. World Health Organization. 2012. Epilepsy. Fact Sheets.